The Advanced Pricing Matrix is an incredibly useful tool, that allows you to set prices based on different conditions; such as the different stores on your account, customer types, quantity ordered, and even between certain dates. From here, you'll click "New Price". Store: You can choose the store you want this advanced pricing attached to. Customer Type: Choose the type of customer you'd like to have access to this price. Variant: Choose if you want this price on a specific variant. Variant Inventory Item: The variant inventory group that this advanced pricing row applies to. End Date: The day you want the price change to end. Starting Quantity: The amount you want the customer to order for the price to kick in. NOTE: If you want a product to sell for a certain price for 1-4 qty ordered, but different for 5+, you'd make a pricing rule for starting quantity at 1, then another rule for starting quantity at 5. Your Cost: How much the item costs for you to make or purchase before selling. Price: How much the customer is paying for this item according to the advanced pricing. Variant Price Surcharge: Lets you set options on the amount a variant price would be. Price Calculator: Attaches the pricing to a Price Calculator. And that is all you have to do. 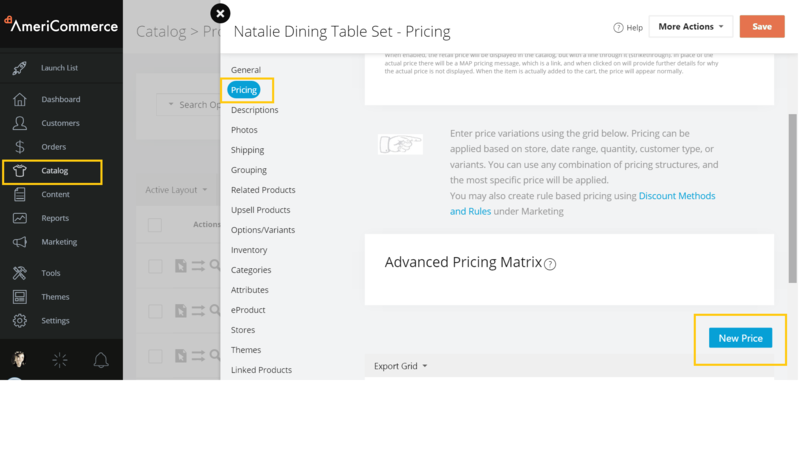 Make a new record in the Advanced Pricing Matrix for each price change you want based on specific conditions, and the product will automatically change price pending on when/how/who is viewing the product.